Kmart is on my list right now — they keep excluding the Northwest from Super Doubles. 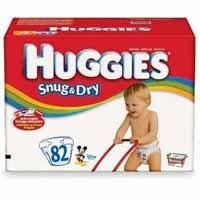 But there is a pretty good deal on Huggies diapers right now, even without doubling coupons. You can roll this catalina and do another Huggies deal or use it on your next Kmart purchase. If you do just two transactions, you will pay 13 cents per diaper (size 3), which is 5 cents cheaper than Costco. I imagine this deal expires tomorrow (Saturday). Thanks, Christy. I fixed the math. Wouldn't you be paying $13.49 on your second transaction, not $11.99?